When you are going through the process of choosing new Oak Flooring for your interior, you also need to consider your staircase (if you have one) because you need them both to fit aesthetically well with each other after installation is complete. Durability and longevity for your oak floor area is always an important consideration but it could be said that the installation and maintenance of oak flooring on a staircase is even more vital, due to the fact that this part of the interior is always a high traffic area. If you choose to do this yourself, fitting your new oak flooring properly is essential, not only to ensure safety, but also to enable correct maintenance of the finished surfaces in order to deliver high levels of durability and life expectancy. The first is that oak flooring is hygroscopic, which means that it is moisture absorbent, and therefore the moisture content within the flooring itself can vary when the surrounding conditions change. The two main reasons for the cause of this are the Relative Humidity and the temperature of the room, so when installing oak flooring on a staircase, it is important to be aware of how conditions can impact on it afterwards. The best practice is to monitor and maintain conditions throughout the year as consistently as possible, because this will ensure that all timber products within your home, including your oak flooring and staircase, remain a constant size. The second factor is that the oak flooring you lay on your staircase, irrespective of its quality, is only as good as the staircase it is being laid upon. In other words, if your staircase is virtually falling apart, do not make the mistake of thinking that by applying new oak flooring over it that it will suddenly perform perfectly well again. It is essential to ensure that your staircase has been correctly prepared because this will prevent creaks and squeaks, whilst helping to avoid a potential accident when it is walked upon. There are a number of installation methods suitable for oak flooring when being fitted onto a supporting subfloor but it needs to be actually ‘fixed’ to a staircase for obvious reasons. This removes the option to ‘float’ your new oak flooring on your stairs, thus leaving either the ‘Nail Down Method’ or ‘Glue Down Method’ as both offer the highest levels of stability and durability after the work is complete. Solid and secure fixings are vital within a stairwell setting for safety reasons. We advise the use of engineered oak flooring for covering the treads and risers of a staircase because of the extra width and length that engineered oak is available in, when compared to solid oak. Prior to installation perform a moisture test on both the staircase and the flooring itself with a Moisture Meter, and record the results. When both readings are the same for a period of three continuous days you are ready to continue. Otherwise continue to acclimatise the flooring until the readings are the same. Next, it is time to measure the Relative Humidity for the area surrounding the staircase by using a Thermo-Hygrometer. The Relative Humidity should ideally be between 35-65% prior to commencing installation, and for optimum ongoing performance, this level should be maintained not only during installation but also after. Take a piece of the oak flooring that is to be fitted on the staircase as a guide for thickness. Then cut the bottom of surrounding architraves and other trim features so they are suitable for the installation of the flooring. It may be possible and easier to completely remove these and refit them afterwards. Lay the oak flooring planks being to be fitted across the staircase in the same direction as the treads and risers. Measure each of the stair treads accurately, not only in terms of width but also depth, because Oak Floors Online can provide machined oak stair nosings in a specific size that fits and finishes the stair tread perfectly. These can be finished with the flooring being used (if unfinished) to your preference. If prefinished oak flooring is being used, then the oak nosings will need to be finished after being fitted in a similar fashion to match up. Before you begin actually fixing the oak flooring to the staircase, make sure that there is an even mix of colour and grain for each plank being used. Cut to size and lay the oak flooring plank required for the first stair but do this without fixing it until you are sure that everything fits perfectly. Make sure you have cut the oak boards suitably to fit the stair treads and also the riser between the treads, so you can achieve a seamless and matching appearance when finished. 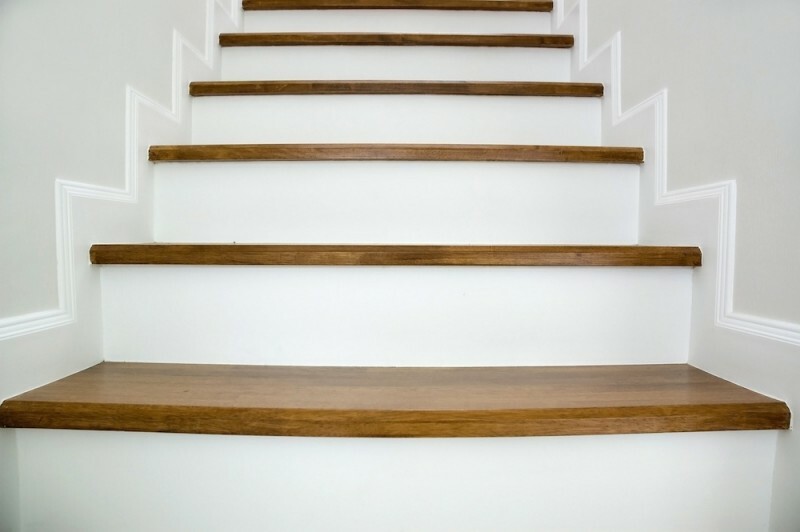 If you choose to use solid oak you need to allow a slight expansion gap on each step at both ends but with this short length of engineered oak, especially a good quality product with plywood underside for improved stability, you can cut each tread tight to the side of the staircase. Each oak flooring plank being installed should cover the full length of the tread it is being fixed down to, thus requiring no joints and providing a completely flat tread surface. Again, if solid oak flooring is used, because of the shorter length specification, you may need to join planks together to cover the whole length of the treads. Before actually fixing the oak flooring boards down, make sure that any which have either obvious or unacceptable defects are put aside and not used. When every step has been cut to size and shape, allowing for the correctly sized and most suitable stair nosing to finish it off, you can begin fixing them in place by either gluing them with a suitable adhesive or by nailing or screwing them down. Do not try fitting the planks without the oak stair nosings because any slight variance may create unsightly gaps. You need to be fitting both together at the same time. If nailing down, use the appropriate flooring cleats or barbed nails to ensure that your flooring planks will not work loose over time and usage. Some fitters will prefer to screw them down because doing this can provide a better and stronger fix. All planks on every tread need to be tested and proven to be securely fixed down, and any face holes caused when nailing or screwing need to be filled sanded and finished appropriately to hide them when work is complete. Continue to install each pre-cut oak plank to the corresponding step that it has been cut for, ensuring that it fits tightly against the oak stair nosing. The nosings need to be fixed in a similar way to the flooring because they will receive most wear and tear, being the foremost part of each step. When all treads and stair nosings are fitted and fixed, you can now fit the surrounding finishing trims to create a seamless appearance. Usually, unfinished engineered oak flooring is preferred for covering an existing staircase because it can then all be finished in the same product to match up with the flooring that is installed, either above on the landing or below on the floor. The other advantage in doing this is that the oak stair nosings are supplied as unfinished, due to the fact that they are machined to order as the shape specifically required, so they will be finished with the same appearance as the oak flooring. If you prefer to fit solid oak to your staircase, it is probably better to simply provide us with a cutting list for everything you want, and then we can machine the lengths to the necessary sizes. This avoids the need for joints when using solid oak flooring. Covering an old staircase with new oak flooring can be a simple process as long as all measurements are accurate, so that the oak flooring planks and the oak stair nosings are machined and cut to the exact required size. Then it’s just a matter of fitting everything to create a beautiful new-looking oak staircase that will impress everyone who sees it.